In a commoditized industry such as financial markets, it has been critical for investment banks to control all aspects of the value chain—from origination to distribution to dealing—in order to maintain a competitive edge. Proprietary access to information placed the balance of power in their hands. But increases in processing power and bandwidth have allowed information to flow more easily and cheaply, particularly in the world of securities pricing and supply, but also in the field of research and information-based investing. With increased electronic trading in some over-the-counter (OTC) asset classes such as rates and FX, in which dealers are being forced to supply prices on a request-for-stream (RFS) basis without the benefit of last-look, the information advantage is shifting to the clients, who can see just as many (or more) prices as the dealer. As a result, the entire competitive landscape is changing. For example, the market-making universe has expanded to include high-frequency trading firms, hedge funds, and even (depending on the asset class) asset managers. OTC markets are being forced onto exchanges, with new execution venues such as SEFs further undermining the banks’ monopoly on the price-discovery process. In the case of securities inventory and supply, dealers have withdrawn from markets in which it is too expensive to warehouse, and assets have shifted from dealer balance sheets into buy-side accounts held at securities-services firms and trust banks, providing these players with critical insight into secondary-market flows. Simultaneously, primary markets are being penetrated by large asset managers, boutique investment banks, regional banks, and private-equity firms. Some large asset managers want to ensure that corporations are issuing the securities they want to invest in, rather than the securities that banks want to structure. Securities deal terms and conditions have long been logged and registered with third-party providers, and these data assets are today being acquired by nonbank entities that want to gain leverage in the origination market. Finally, information-services firms are looking to digitally deliver a spectrum of data and analytics, workflow tools, and information-based products to a broad audience. Rapid advances in information technology are enabling more entities to gain access to larger amounts of rich information at lower cost, and the impact has been felt across numerous industries. CMIB is no exception. The last two years have witnessed a data explosion, and the amount of data is expected to grow another tenfold in the next six years. A sevenfold increase in mobile penetration over the past four years is also having a profound effect. 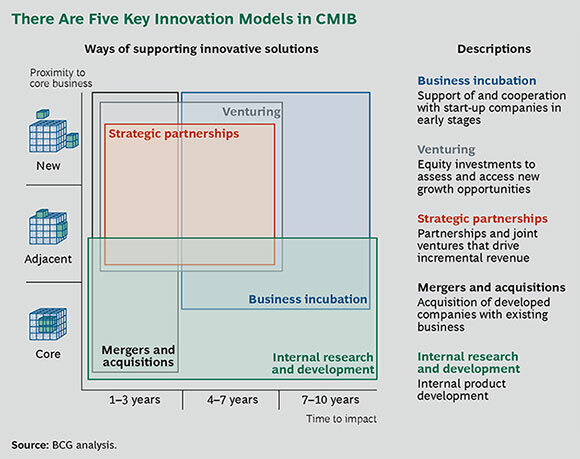 This acceleration in innovation comes at a time when the CMIB industry is most vulnerable. Traditionally, investment banks have been shielded by their regulatory status, their unique ability to deploy risk capital, their unrivaled understanding of and ability to serve clients, their ability to attract the best talent, and the universal belief that they are the trusted agents of a complex global financial system. But these foundational pillars are beginning to crumble. Regulatory advantage has turned to disadvantage as sustained pressure continues to take its toll on the traditional operating model. Risk capital now comes at a punishing price. Cost-cutting, unbundling, and ring-fencing undermine the ability to serve clients. The global financial crisis and subsequent scandals have damaged banks’ reputations as trusted institutions. In short, the information advantage that investment banks have traditionally enjoyed is being eroded at the very moment when information technology is entering a new evolutionary phase. Digital advances are facilitating the flow of information away from banks and into new channels. These advances are also allowing data to be created and controlled by nonbank entities. Some CMIB firms see the handwriting on the wall and are implementing measures to stay ahead of the curve. For example, they are leveraging their unique networks and ability to standardize disparate sources of OTC market data to offer agency-like execution services to clients who want access to diverse pools of liquidity. Other firms are adapting too slowly, if at all. Investment banks will need to choose where on the value chain they wish to focus. But with digital advances come digital opportunities. The relative lack of CMIB-focused start-ups is due in part to the high level of complexity as well as the regulatory requirements associated with the industry. It is not easy to replicate the functions of an investment bank, and significant amounts of venture capital are required in order to be successful. That said, digital innovation is allowing new value propositions to emerge, particularly in the realm of sales and trading. Forty-two percent of the CMIB-related financial technology start-ups in our sample are targeting the distribution end of the value chain. Another 41 percent are targeting the research and value-creation process, 11 percent have offerings in origination, and a small portion cover topics such as compliance and surveillance. Value enhancers help investment banks overcome a traditional structural impediment or workflow challenge. Examples include customer relationship management (CRM) tool providers, “matching” agencies for bonds, and open-source initiatives that allow banks to develop their own apps, use analytics to monitor employees (in light of recent conduct challenges), and discover cybersecurity risks. Thirty-eight percent of the start-ups in our sample fall into this category. Disrupters look to disintermediate banks through new technology or tools that enable traditional clients to act more independently from investment banks. Examples include providers of data and analytics that allow for independent valuations of structured credit, electronic networks that allow hedge funds to attract accredited investors, and cognitive intelligence that lets investors make their own trading decisions. In the digital CMIB world, what is often called desktop real estate—a comprehensive screen presence across a range of devices from desktop terminals to smartphones and tablets—is going to be even more important than it is today. Currently, each investment bank approaches the problem individually. But it is a challenged model. Institutional investors cannot realistically afford to have every investment bank portal open on their desktops. Meanwhile, the prevailing trend is to make trading anonymous, particularly in OTC markets. The ability of banks to facilitate price discovery and serve clients is predicated on their ability to know whom they are trading with. Indeed, the level of price and service that clients receive depends on a number of factors, including credit quality, institution type, size, and relationship. (LEIs) for trade reporting have essentially put clients into an anonymous digital format. In their drive to reduce costs, investment banks are also becoming less inclined to give away research and other rich information assets, such as benchmarks, in order to attract trade flow. Coupled with the advent of self-research, independent research, and a potential unbundling of research from commissions (in Europe), banks are finding it more difficult to serve clients through the traditional cross-subsidization model. The role that they have played in the value creation process is being undermined, and the glue that has traditionally bound them to the client is losing its stickiness. Meanwhile, information service providers and exchanges are looking to enhance the value creation process by offering a spectrum of information-based tools that allow traders to come to their own conclusions about how and where they want to trade. They are acquiring or developing indices and benchmark assets for information-based products such as exchange-traded funds (ETFs), futures, or volatility contracts, which now account for an ever-larger share of market volumes. As the intellectual property that is central to so much trading activity migrates away from investment banks to other intermediaries, value is shifting into a range of new areas. We expect banks to compete with alternative providers that can use their control of data and analytics to change market shares and market structure. Indirect, nontransparent revenue models will give way to new revenue streams and expand the capital markets ecosystem to include innovative types of players and services—and create winners and losers among the incumbents. And this is only the first stage. As digital technology continues to evolve and as the CMIB industry struggles to find a firmer footing, more financial technology start-ups will likely look to be challengers rather than helpers. The CMIB industry will be increasingly buffeted by digital disruption, just as other, easier-to-access areas of banking are already being affected. In securities origination, for example, we currently see book-building software being deployed to help investment banks reduce long proof-of-concept lead times to facilitate the IPO process. But a recent bout of private-equity investment in the area has raised questions about possible future uses by alternative intermediaries. Indeed, the IPO process could evolve from conventional book-building toward targeting segmented investor communities and pricing new issues through electronic auctions in order to generate maximum interest and subscription. Blockchain technology is a digital phenomenon that clearly has the potential to change the financial market paradigm. It could be deployed to simplify and accelerate banking processes, such as settling a wide range of real-world financial transactions using a distributed ledger that is verifiable without the need for a third party. We may begin to see the emergence of so-called smart contracts or cryptosecurities, whereby stocks become digital records that can be both issued and traded on the Internet, considerably reducing transaction costs—especially if issued directly into the market. A digital stock system could also allow small and medium-size companies to raise public funds more easily and at lower cost. At its core, blockchain technology represents an opportunity to recreate the financial system that we know today in a parallel, Internet-based universe that is both transparent and secure. The same principles that govern securities—issuance, trading, clearing, and settlement—would continue to apply. But they would operate on the network architecture of the Internet, instead of on the complex myriad of trading, clearing, settlement, and depository venues that have been created over time across multiple asset classes. We have not addressed crowdfunding, P2P networks, or payments in our capital markets analysis, but there are indications that institutional investors have already started to use crowdfunding websites to gain stakes in new businesses, such as in the real estate sector. One website, for example, enables crowdfunders to pool their capital and compete with institutional investors or coinvest with venture capital funds. There is a perceived threat that more buy-side firms will tap crowdfunding sites. And as more institutional investors start to recognize the opportunities that crowdfunding websites provide, there could be an emerging threat to parts of the CMIB industry, such as the private placements market or the corporate and investment banking payments world. Banks should be ready to navigate the financial technology world and identify winning propositions ahead of the pack. It will be important for investment banks to co-innovate alongside the start-up industry in order to ensure that their organizations are among the disrupters rather than the disrupted. By actively engaging both business and IT capabilities within the start-up environment, investment banks can better understand the kind of disruptive technologies that are emerging—and build test-drive environments to learn which forms of adoption can be injected into the product and service portfolio. Some banks are moving away from consuming software toward producing it, arranging in-house computer programming festivals (often known as hackathons) in addition to pioneering new open-source initiatives. Given their understanding of the intricacies of capital markets, banks may be better equipped to become technology innovators than one might think. Securities pricing and supply, client behavior and data, and a unique understanding of the idiosyncratic nature and complexities of capital markets put investment banks in a strong position to become information technology companies, as compared with technology companies that would like to become banks. Business incubation (and acceleration) can provide support of and cooperation with start-up companies in early stages. It effectively outsources the R&D function, while providing wider corporate growth options and investment opportunities as well as enhanced employee recruitment and retention. As a result, banks gain “first pick” potential in the case of a promising start-up. Venturing allows banks to make equity investments in order to assess and access new growth opportunities, as well as to participate in strong growth and profit potential. It also provides portfolio extension, especially in advanced technologies and products. Strategic partnerships allow banks to explore joint ventures that drive incremental revenue and extend market potential. They help close the intellectual-property gap between the traditional investment bank and the new wave of Silicon Valley innovation. They also allow banks to reduce investments in noncore corporate capabilities and help create competitive advantage in the new world. Mergers and acquisitions can be fast-to-market solutions that allow investment banks to acquire developed companies with existing business in order to gain a toehold in the fast-moving digital universe. Internal research and development has a significantly longer lead time and a considerably higher total cost of ownership, but it allows banks to maintain full control. While we are seeing various banks make meaningful moves in many of these areas, the innovation arena is one in which considerably more progress needs to be made. Investment banks have the option to try to embrace digital technology and become new types of intermediaries. But they must first conduct a systematic review of all areas where the business model can be upgraded through cost reduction, better distribution that lifts revenues, and improved capital usage at the transaction level. Partnerships will play a key role, and these can occur all along the value chain. (See Exhibit 2.) For example, we may see investment banks partnering with competitor firms to create industry utilities and achieve fresh efficiencies. Such accords will only be possible within a digital context. Similarly, they may partner with traditional technology vendors to outsource industrial functions, or with new start-ups in an effort to unlock value, realize latent opportunities, and leapfrog advances that cannot be managed in-house. For now, the industry is still operating very close to its core model. But by partnering with, as opposed to simply outsourcing to, the largest and most well-established digital providers, investment banks may start to rediscover size and scale and counter the effects of regulation and changing business economics. Two areas are especially pertinent: digital trading and digital utilities. Digital Trading. In trading, there are several digital opportunities. For example, Mosaic Smart Data looks to help sales and trading desks establish an external view of aggregated electronic-venue performance to see how much of the overall market wallet they are capturing. Banks often pursue electronic market share for market share’s sake, which can lead to unprofitable performance. Client flows are increasingly fragmented across trading venues, which, with weakened client relationships, makes understanding client drivers difficult. By commingling electronic market data with diverse data sources and providing the event processing and visualization capabilities to analyze real-time and historical data, Mosaic Smart Data also helps banks develop an internal view on client profitability by quantifying the P&L on an individual trade basis and assessing the real value of an individual client’s flow. Cognitive intelligence and machine learning are also likely to have a significant impact in the world of algorithmic trading, especially through mining new sources of data in new ways. The buy side may leverage big data to deploy new analytical trading tools, such as by using greater access to historical data and statistical analysis to make market predictions, or using machine-learning algorithms to discover clearer market entry and exit signals. Visualization tools and virtual-reality technology also offer new ways to glean meaningful insight from data. Dealers may try to anticipate this new wave and empower the institutional buy side with trading tools that provide more parity with their own trading systems. They may also look to aggregate unstructured data sources within their own organizations, such as internal social network and enquiry systems, into a single, structured platform that can be mined by machine-learning tools for new insights on pricing and client activity. Community-based investing is another key theme for many financial-market start-ups, with various models allowing individuals to mirror the real trades of successful or professional investors. Dealers might look to anticipate this trend by partnering with major social-media giants to offer trade execution as well as ongoing market commentary. Some are already looking to use big data to provide interactive digital tools that create value by generating answers to client- or product-specific questions that could never before be answered in a meaningful way—a Siri for financial-market investing, if you will. Just as dealers have supplied institutional investors with algorithmic tools to help them disguise their intentions in the equities market, they may opt to do the same with the next generation of trading tools. The buy side is pushing for standardization of securities and is looking for new networks in which to take advantage of better access to liquidity. They may want to be less reliant on banks and to use tools that enable them to act more independently. It may seem counterintuitive to develop tools that enable a more independent buy side, but by embracing change instead of denying it, the sell side could actually enhance client relationships. In search of efficiency, some investment banks have created large central functions across diverse activities. But these efforts have too often focused on cost savings at the expense of performance and effectiveness. We believe that the time has come to inject excellence into centralized functions by creating what we call smart service partners, which can bring guarantees not just on cost but also on quality and time-to-delivery. A smart service partner is a division that sits outside the investment bank but is still part of the wider organization and harnesses various collaboration models, combining them with a commercial approach. The division not only rationalizes all the disparate elements of the value chain but also fosters innovation through separate P&L accountability and its own corporate culture and standards of excellence. Monitored through joint governance, observable benchmarks, and explicit penalties (by giving the divisional customer the option to search the market for alternative suppliers), the smart service partner can help investment banks avoid many of the pitfalls and drawbacks that are commonly associated with exclusively budget-driven functional approaches. For business-specific services, the catalogue must be very focused and aligned with strategic requirements. For instance, in cash equities, which is highly competitive and has a high level of electronic trading, cost is an essential element of competitiveness, as is the straight-through processing (STP) rate. Meanwhile, in structured equity derivatives, cost is not submitted to the same level of scrutiny because relatively high revenues on low volumes obscure the high costs associated with the business line. Nevertheless, the ability to issue a contract on time and with a high degree of legal certainty is imperative in this segment. In short, service-level agreements between the investment bank and the smart service partner must be simple, while focusing on what really matters for the business, as opposed to being exhaustive and hard to implement. Budget-driven approaches validated at the CEO level as opposed to at the divisional level have been a failure. The smart service partner can encompass every digital initiative across all CMIB functions. It retains a “one firm” mindset and provides services to a key client, be it the CFO, CTO, CIO, COO, or business head, in a formalized customer-provider relationship that ensures functional efficiency without centralized ineffectiveness. Banks must also create a roadmap for simplifying the IT landscape in a way that helps to achieve digital objectives, as well as scale IT resources up and down as needed. For example, investment banks should look not only to decommission legacy systems but also to eliminate products that do not add much value and that require many supporting applications. Banks may consider two-speed IT, which employs both traditional development processes for legacy systems and agile methods for digital platforms. This approach reflects the considerable differences—in orientation, demands, and required capabilities—between industrial-speed IT and digital-speed IT. Industrial-speed IT, with its primary emphasis on cost optimization rather than flexibility, is characterized by waterfall methods that assure predictability, long lead times, and functionally organized teams of individuals with specific skills. Digital-speed IT is characterized by unpredictability and places a premium on flexibility, speed, and collaboration through agile software-development frameworks that can reduce IT development cycles to weeks or months. As for governance, awareness of how to handle digital technology should be created through coaching and training. The organization must learn how to adapt to digital technology and its quick-cycle iterations. Moreover, both the mix of resources and the operational approaches to handling digital volumes need to change. For example, talent acquisition should focus on high resilience and fail-safe digital needs rather than business knowledge alone. The most talented individuals should have a career path that leads to senior management, rather than being seen as secondary to traders.